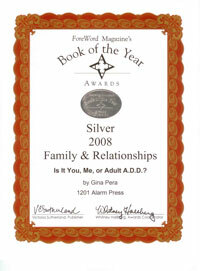 You are here: Home / ADHD News & Research / ADHD and Obesity: Can ADHD Make You Fat? 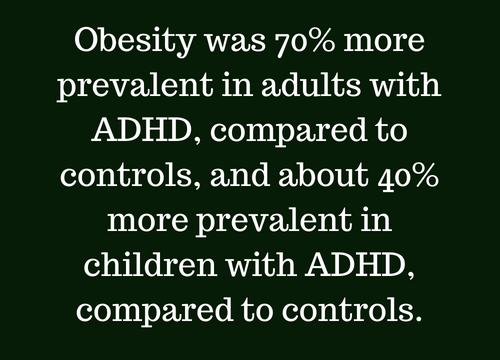 For years, ADHD experts have recognized the link between untreated ADHD and obesity. As for weight-control experts and gastric-bypass surgeons? Most missed the memo. Is it territorial jealousy? Willful ignorance? “ADHD Denial”? Let’s be charitable and call it one more casualty of our highly specialized medical system. 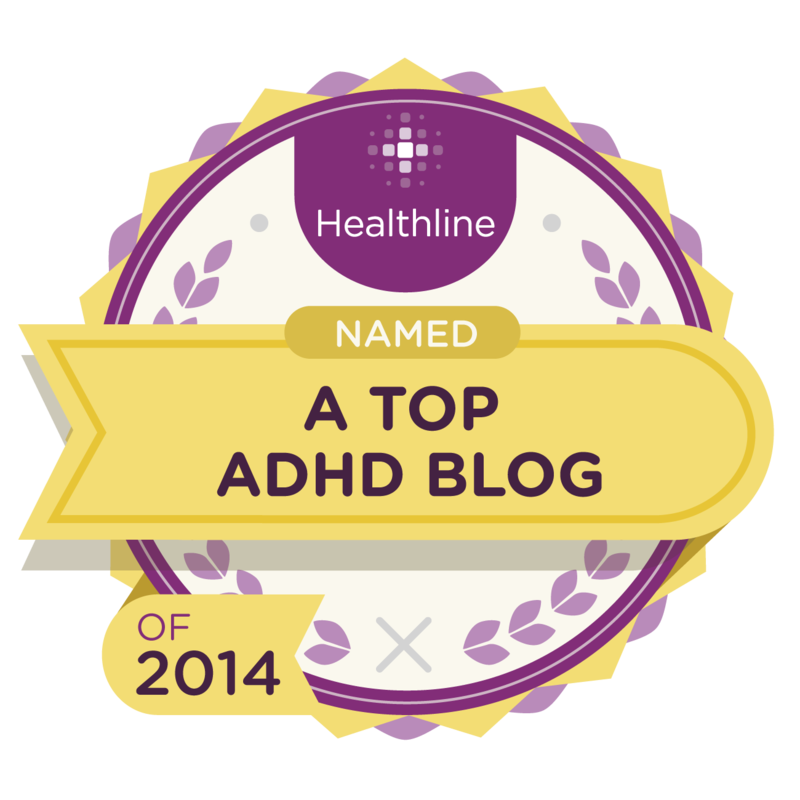 One that too often overlooked undiagnosed ADHD’s contributions to many physical issues. But make no mistake: It is extremely important that anyone considering drastic weight-loss surgeries first be screened for ADHD. With their research, two Toronto-based clinicians and researchers sought to bridge this cross-disciplinary knowledge. Physician Lance Levy and psychologist John Fleming set out to determine if medically treating severely obese subjects with newly diagnosed ADHD would result in sustained weight loss. In short, yes. Yes, it did. 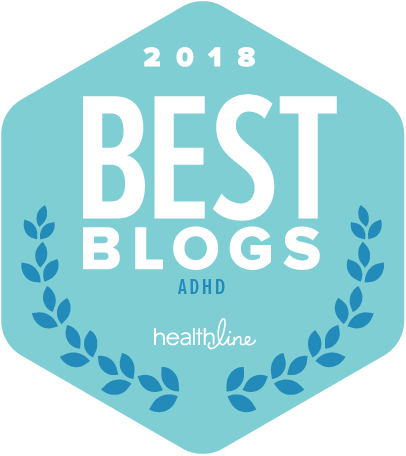 Let’s examine two of their studies, hear from a veteran ADHD expert who early on spotted the connection between ADHD and eating patterns, and take a peek at the mounting literature. The connection is undeniable: ADHD is associated with obesity. Moreover, stimulant medication reduces the risk of obesity for these people. 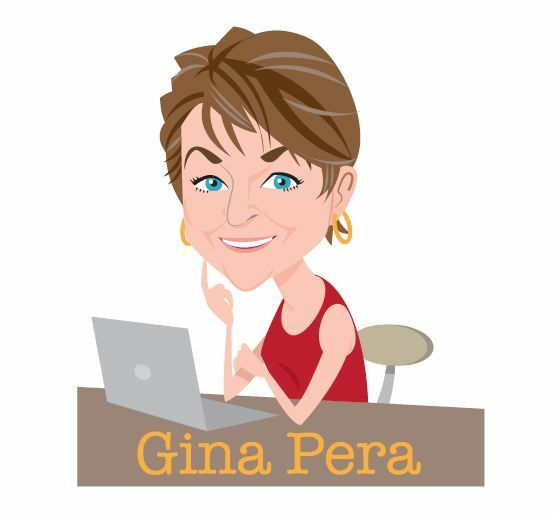 Gina, Good article but one question. I’m at work and CAN’T GET DISTRACTED and don’t have the PATIENCE today to give it deep thought (sounds ADHD like). What are the 2 or 3 bullet points as to why we gain weight and can’t get rid of it? My quick take – from my experience would be the ‘food high’ or stimulation of eating and esp trying new foods. I then overeat. Can regular ADHD meds help to curb this? Yes, stimulant medication has been shown to reduce vulnerability to obesity. Yes, eating can be “stimulating” (see #1 for a better stimulant). Disorganization means no food at home, poor inclination to cook, plan meals, etc….so eat fast food or whatever’s handy (chips, donuts, etc.). Forgetting when you last ate! Poor read of the signals (e.g. Body says, “we’re full now” but you don’t hear it…you can’t “put on the brakes”). Disorganization and lack of follow-through in getting regular exercise. The first study: Among people who had failed to lose weight by other means, 33 percent were found to have ADHD; after 466 days of stimulant-medication treatment, subjects lost 13 percent of their original weight. Now let’s examine the details for each study. Study #1: Will ADHD Treatment Help? The first study identified subjects who had a history of difficulty with weight-loss and who likely had ADHD. 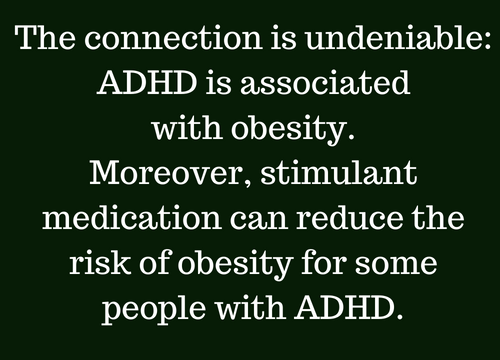 The hypothesis was that untreated ADHD was proving an impediment to weight loss. To determine whether attention deficit hyperactivity disorder (ADHD) pharmacological treatment of severely obese subjects with newly diagnosed ADHD would result in sustained weight loss. Longitudinal clinical intervention study of the effects of ADHD medication on weight change over 466 days. 78 subjects (6 male, 72 female, mean age 41.3 years, BMI 42.7 kg m(-2)) out of 242 consecutively referred severely obese, weight loss refractory individuals were diagnosed as having ADHD. Sixty-five subjects received treatment and 13 remained as controls. Standard screening tests identified subjects likely to have ADHD. A diagnosis was made in 78 subjects by semi-structured clinical interview. ADHD subjects were screened for comorbid conditions (binge eating disorder, mood disorder, sleep apnea, chronic pain, gastroesophageal reflux disease). Satisfactory resolution of symptoms of comorbid conditions was achieved prior to the introduction of pharmacotherapy for ADHD. Subjects not accepting, tolerating or remaining on ADHD medication served as controls. Weight was measured at sequential clinic visits after initiation of pharmacotherapy. After an average of 466 days (s.d.=260) of continuous ADHD pharmacotherapy, weight change in treated subjects was -12.36% of initial weight and in controls +2.78%, P<0.001. Weight loss in treated subjects was 15.05 kg (10.35%) and weight gain 3.26 kg (7.03%) in controls, P<0.001. 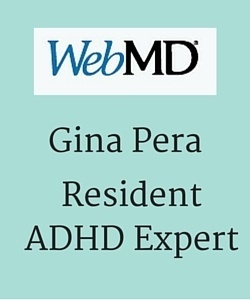 ADHD is a highly prevalent condition in the severely obese population. Treatment of ADHD is associated with significant long-term weight loss in individuals with a lengthy history of weight loss failure. This result is likely because of the positive effects of treatment on self-directedness, persistence and novelty-seeking behaviors. ADHD should be considered as a primary cause of weight loss failure in the obese. 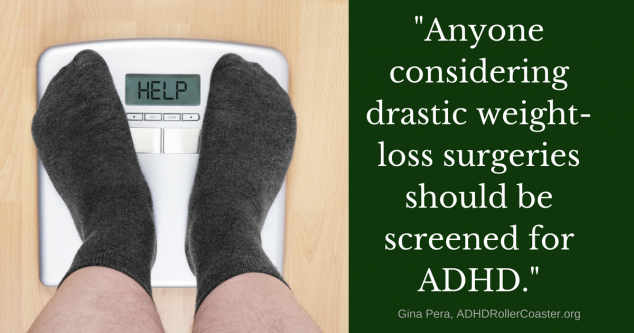 Individuals seeking medical or surgical weight loss should be evaluated for ADHD and treated appropriately before intervention. This may improve the outcome for medically managed patients and avoid complications in surgical subjects because of poor compliance with diet and supplement requirements. Study #2: How Many Obese Study Subjects had ADHD? Past and current symptoms of Attention Deficit Hyperactivity Disorder (ADHD) were assessed in a clinical sample of severely obese females. Core symptoms of ADHD were examined in 75 consecutive, severely obese (BMI > or = 35) women referred to a medical specialist for the non-surgical treatment of obesity. Subjects completed both a retrospective report of childhood symptoms of ADHD (Wender Utah Scale) and two standardized adult ADHD symptom scales. The frequency of clinically suggestive elevations in ADHD scores was substantially and significantly higher than the normative samples in 9 out of 11 symptom subscales. Inattentive symptoms, but not hyperactive symptoms of ADHD, were frequently reported. Overall, 26.7% of the sample reported significant symptoms of ADHD in both childhood and adulthood. This preliminary study suggests that severely obese women report significant symptomatology related to both childhood and adult ADHD. I first read about this topic in a book chapter called “Disordered Eating and ADHD.” It was contributed by the researchers above, Levy and Fleming, to the groundbreaking Gender Issues and ADHD: Research, Diagnosis, and Treatment, edited by Patricia Quinn, M.D. and Kathleen Nadeau, Ph.D. 2002. By the way, psychologist Kathleen Nadeau, and physician Patricia Quinn teamed up originally to address the long-overlooked needs of women and girls with ADHD, founding The National Center for Girls and Women with ADHD [update: closed in 2013]. Therefore, it’s unsurprising that Quinn and Nadeau stood on the vanguard of creating awareness on this ADHD-obesity issue. The ADHD/disordered-eating connection is not difficult to understand. Healthy dietary regulation requires organization and planning— two areas of cognitive functioning that are typically difficult for those with ADHD. Good eating habits also require self-awareness – awareness of when one is hungry, awareness of when one is full. Individuals eat for many reasons besides hunger – including boredom, self-stimulation, anger, sadness, reward, simple food availability, and stress relief. 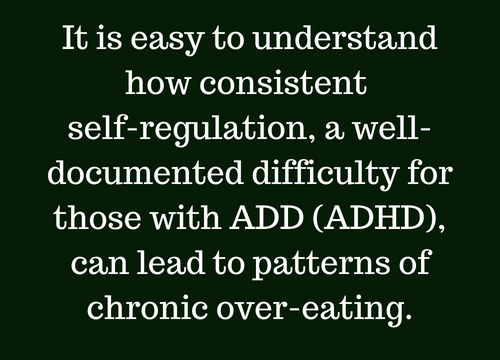 It is easy to understand how consistent self-regulation, which is a well-documented difficulty for those with ADD (ADHD), can lead to patterns of chronic over-eating. 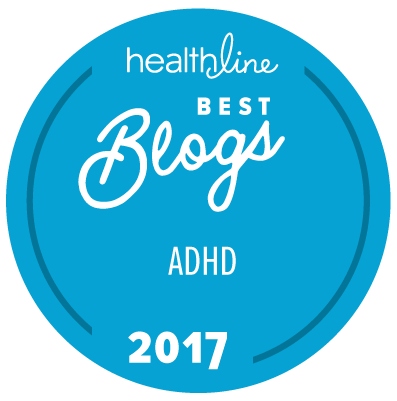 More recently, the literature is mounting on the relationship between ADHD and eating behaviors. Here are some highlights from Attention-Deficit Disorder and Obesity: Update 2016, by Samuele Cortese and Luca Tessari. We retained a total of 41 studies, providing information on the prevalence of obesity in individuals with ADHD, focusing on the rates of ADHD in individuals with obesity, or reporting data useful to gain insight into possible mechanisms underlying the putative association between ADHD and obesity. Overall, over the past 4 years, an increasing number of studies have assessed the prevalence of obesity in individuals with ADHD or the rates of ADHD in patients with obesity. Although findings are mixed across individual studies, meta-analytic evidence shows a significant association between ADHD and obesity, regardless of possible confounding factors such as psychiatric comorbidities. An increasing number of studies have also addressed possible mechanisms underlying the link between ADHD and obesity, highlighting the role, among others, of abnormal eating patterns, sedentary lifestyle, and possible common genetic alterations. Importantly, recent longitudinal studies support a causal role of ADHD in contributing to weight gain. The next generation of studies in the field should explore if and to which extent the treatment of comorbid ADHD in individuals with obesity may lead to long-term weight loss, ultimately improving their overall well-being and quality of life. Paper #2. 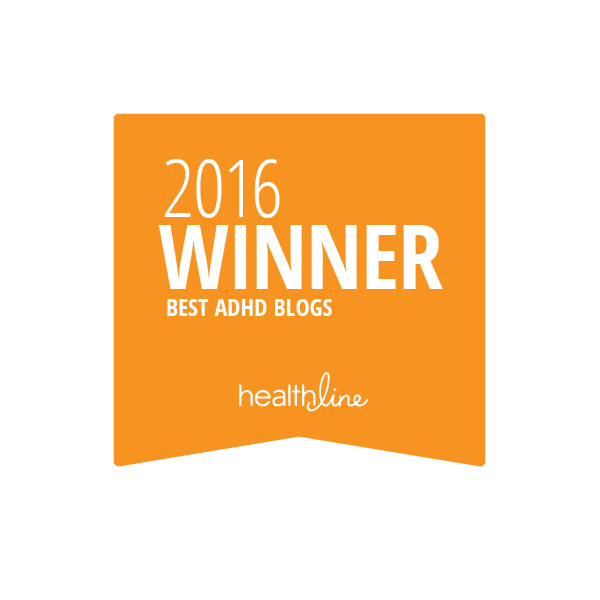 Association between ADHD and Obesity: A Systematic Review and Meta-Analysis. Also from a team headed by Samuele Cortese: Association between ADHD and Obesity: A Systematic Review and Meta-Analysis. Forty-two studies that included a total of 728,136 individuals (48,161 ADHD subjects; 679,975 comparison subjects) were retained. Researchers found a significant association between obesity and ADHD for both children (odds ratio=1.20, 95% CI=1.05-1.37) and adults (odds ratio=1.55, 95% CI=1.32-1.81). The pooled prevalence of obesity was 70% higher in adults with ADHD (28.2%, 95% CI=22.8-34.4) compared with those without ADHD (16.4%, 95% CI=13.4-19.9), and by about 40% in children with ADHD (10.3%, 95% CI=7.9-13.3) compared with those without ADHD (7.4%, 95% CI=5.4-10.1). and 3) using directly measured height and weight. Gender, study setting, study country, and study quality did not moderate the association between obesity and ADHD. ADHD was also significantly associated with overweight. 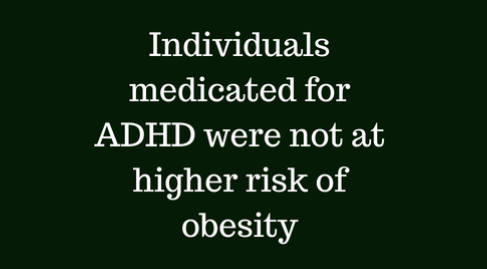 Individuals medicated for ADHD were not at higher risk of obesity. How about YOU? 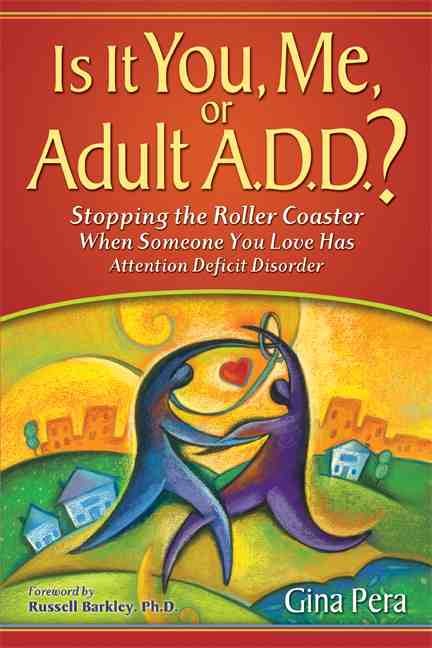 Do you suspect that ADHD has affected your or your partner’s ability to maintain a healthy weight? for reasons similar to those who are overweight: lack of planning, not paying attention to internal phenomenon, and so forth. Excellent piece, as usual, – so timely and so accurate as we move further down the path of identifying how ADHD can create destructive medical issues downstream from compromised executive function. Others include hormone dysregulation, downstream from high glycemic diets [seen with polycystic ovarian syndrome, even in adolescents], high blood pressure and diabetes [nutritionally related], and many others. With comorbid depression and ADHD some simply want the depression addressed, and just don’t want to treat with a stimulant – ADHD denial is firmly in place. They will take the SSRI or SNRI, but not the necessary stimulant for the ADHD. The outcome is predictable and happens often: They gain weight on the fact that the SSRI or SNRI appears to downregulate [lower] the effectiveness of the pre frontal dopamine, with a subsequent drop in executive function – simply stated their ADHD intensifies. Good judgement about food is lost, compulsive eating can intensify. Dopamine and serotonin appear to be sitting on both ends of a seesaw, when one goes up, the other can go significantly down – as is seen with children who have comorbid depression. Untreated, the depression almost always intensifies with stimulant meds – resulting in a big emotional crash in the PM. Said another way on the weight issue: The downregulation of the dopamine is associated with downregulation of executive function and they become: disinhibited. Not inhibited, – disinhibited… it just doesn’t matter. And on top of eating without reservation, they are forgetting the name of their best friend, and can’t remember the first part of the sentence – all related to this downregulatory phenomenon. The basic fix: Treat the ADHD simultaneously now or later, perferrably at the outset. Antidepressants just don’t fix ADHD, they aggravate it. Effective executive function is necessary for consistent self regulation… as you have so frequently pointed out. Your comment sheds light on a huge piece of my ADD history. Having just been diagnosed with ADD at 24, huge pieces of the puzzle of my life are falling into place. Your explanation of an SSRI’s effect on the ADD brain makes sense of an incredibly important period of my life that I have struggled to reconcile with for years. At 19, I was diagnosed with major clinical depression and prescribed an SSRI. However, it not only exacerbated my depression symptoms, it completely changed me. I went from an adventurous, (too) hard-working, and athletic college sophomore to a girl who rarely left her bed, binge ate uncontrollably, struggled with thoughts of suicide, and gave up on studying for an entire semester in college. It left me utterly shaken and stripped of any sense of self. Finally, I switched to an SNRI which, though it did not push me further into depression, did not address what I now know to be ADD concerns. Thank you so much for commenting on this article. Your expertise and insight have helped to fill a black hole in my life that has been dogging me for years. The 2009 Levy/Fleming study raises a couple of questions for me…. 2. Was anything done to address “rebound hunger,” a fairly common problem associated with long-acting stimulants? And of course, I’d love to see a follow up. My suspicion is that the ADHD dieters will probably perform pretty much the same as non-ADHD dieters, i.e. 95% regain all the lost weight after 5 years. As a proponent of body acceptance and Health At Every Size, I believe that an individual’s weight or body size is not necessarily a good indicator of their current health or an accurate predictor of future disease. I wish that public health authorities, and the media, would stop focusing on weight loss and instead put the focus on good food choices and enjoyable, appropriate exercise. These are health-promoting habits in their own right, and beneficial for everyone to adopt, even if weight loss does not result. That said, permanent habit change of this nature can be tremendously difficult even for those of us with no deficits in PFC function, and from what I have seen it is an absolute nightmare for people with ADHD. Even when they are diagnosed and treated, they seem to need a lot of outside structure and support in order to effect and maintain positive lifestyle changes. That’s why I’m so curious about the dietary intervention used in this particular study. My partner has ADHD and has wished to lose weight since adolescence. She has dieted three times, each time eventually regaining the lost weight plus a bit more (just like most other people). She is nowhere near “severely obese” as described by Levy/Fleming, and AFAIK she has never been a severe junk food junkie as described by Nadeau. But despite her high intelligence, *and* ADHD medication, the executive demands of meal planning, food shopping and cooking are extremely stressful for her and take up an inordinate amount of time – or they don’t get done at all if she is the least bit busy. When I came to live with her I took on the food related duties, partly because I enjoy cooking and partly to relieve her of what was obviously a great burden in her life. She only seems able to stick to a structured eating program if someone else does all the planning, shopping and cooking for her. “Intuitive eating,” favored in the body acceptance community, does not seem possible for her – with intuitive eating, there is simply too much choice every day, and that is overwhelming. As far as exercise, again, she seems to need a very great deal of support and motivation from outside – otherwise she simply does not find the time, despite knowing that exercise is beneficial in myriad ways. I used to provide a lot of this support and motivation, but I have recently given up. I’m tired of trying to get somebody off the couch. I need to attend to my own body, and if she doesn’t want to leave the couch that is, in the end, her problem. Thanks for weighing in, Dr. Parker. “Downstream” is right — we definitely need more cross-disciplinary knowledge with ADHD. I’m so glad that you explain the serotonin-dopamine teeter-totter. (When I explain it to people in the ADHD support groups, they look a little skeptical — they’ve never heard such a thing from their physician — so it’s great to hear it from a medical expert!) I hope you’ll discuss this in your upcoming book on ADHD medication strategies. What do you think about B vitamin deficiency also being a culprit in the PM crash (or so-called rebound)? Good points about Health at Every Size. I am certainly starting to accept my own changed size from earlier years — what a relief! Good health is what’s important, and if people can’t get organized enough to shop/cook/eat-well or motivate themselves to exercise, it’s hard to be healthy. Given Dr. Parker’s example of the dopamine-serotonin teeter-totter, it perhaps follows that treating ADHD without treating a person’s depression, anxiety or other serotonin issue can have a similar effect, in that it could aggravate anxiety or depression. So, if the person with ADHD who is taking a stimulant still gets stressed out about food preparation and the like, then maybe anxiety is the bigger (or at least unaddressed) diet-related problem for this person. competing demands and gave up, relapsing to old habits. ended in exactly the same way and for the same reasons. 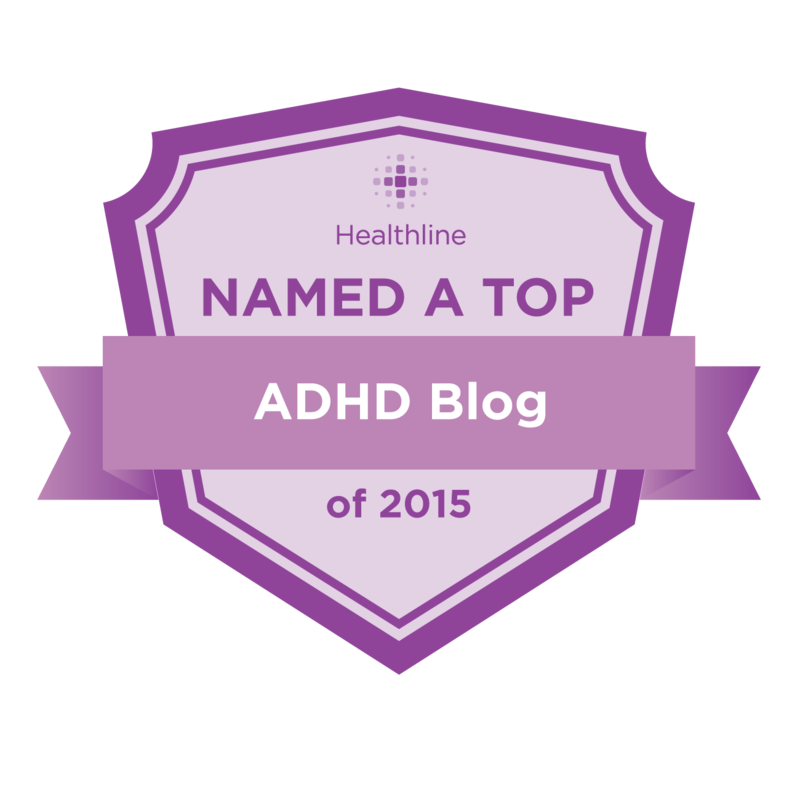 ADHD that were most detrimental to successful weight loss. order in which they had been listed. to meal preparation or physical activity could be done reliably. 1. *Office findings:* Yes comorbid diagnosis of depression is often present with the PM drop, but missed because ADHD ‘depression’ is often more cognitive and missed – just as is ADHD ‘anxiety’ – again more cognitive… and all of this is spelled out in my new book, thanks for asking. The unhappy result of the missed depressive diagnosis, because the ‘Clint Eastwood’ guy or gal hates depression and denies it, – is a big crash in the PM. Actually the stimulant aggravates the depression, and they go from cognitive: “I do not care, whatever.” to… affect: “You have really hurt my feelings! I am in so much pain with you!” – but they still say, I’m *not* depressed – I’m just mad!! Depression is seen as weakness. 2. *Lab findings:* I have been impressed by the neurotransmitter findings we do on refractory and otherwise challenging cases with ADHD: comorbid conditions often don’t show in the office even with careful questioning, but the biomarkers from urine testing are helpful from http://ww.Neurorelief.com These findings often show 5HTP diminished as part of the ADHD picture. Evidence counts. Lab: Neurotransmitter findings are derided by some who see the findings as *not diagnostic* – a point that the company and I completely agree upon. They are not indeed diagnostic of DSM 4 process. 5HTP [serotonin precursor] deficiencies don’t always look like depression, the can result in OCD symptoms, trichotillomania, or many other problems like ODD. But, they do work as effective biomarkers, and we have seen correction of these imbalances result in some dramatic turnarounds – even with tic disorder. SPECT imaging gets the same heat because it is *not diagnostic* – and is, in fact, another, quite precise, biomarker. The problem with evolving evidence is simple: You can’t go from one cookie cutter diagnosis like ‘depression’ to another cookie cutter finding with a subsequent cookie cutter recommendation. Some of my SPECT colleagues aggravate the use of evidence as they leave the recommendation piece in ‘cookie cutter land’ rather than taking the investigation to the next important level: clinical outcome functioning. Understanding the limitations of SPECT will help with the consternation some have with neurotransmitter testing. – All of these activities are quite similar to lipid testing for coronary heart disease: not diagnostic but clearly useful. I came on this post just now. I am reminded of the retrospective study conducted by my colleague and office mate Jules Altfas, MD (who I consider to be our local best-doc for AD/HD in adults). He looked at the records of a number of his weight management patients who he also diagnosed (very conservatively) with Ad/HD. The study was published in 1992 and so far as I know, did not receive wide attention. Here’s the URL (my skills stop short of inserting links). One more thing: Paul Elliott, MD from Texas, a one-time luminary/maverick in the field of AD/HD treatment (since retired I believe), asserted at many national conferences that anytime there is substance abuse of any kind (inc. cigarettes, coffee) except for hallucinogenics, AD/HD should be presumed present until ruled out. 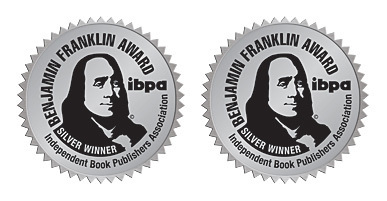 Ten years ago this created a lot of discomfort and skepticism. I imagine it would do less of that, now. The information is very informative and has helped at least narrow down why, in layman’s terms, in the evening I have to stop reading my book, put it down and make a special effort to get a snack (and all the time not wanting one because I am not hungry and wish the urge wasn’t there). I do have ADHD and Tourettes Syndrome so it is unbelievably difficult. I only take Concerta on the weekends because my tics would be out of control at work during the week. I am 61 and nothing has slowed down with age. I do appreciate the fact that the medical profession is taking this seriously and involved with so much research. In the meantime, I feel for you. It’s hard enough to find ADHD treatment that works well, without having to deal with tics. 🙁 Good luck! 58% of morbidly obese people are ADD according to research. Every time I talk in front of people who are severely overweight about ADD and weight, about 1/5 of the people come up to me afterwards asking for information on ADD and tests for ADD. Thank you for your evangelizing! Truly changing people’s lives for the better, Alan!